LaKesshia Slaughter is a plus-sized fashion model of Black/African roots with rich brown eyes who confidently accentuates the eloquence of her unique beauty through elegance and positivity. Although plus-sized modeling is becoming more and more of an “acceptable” reality in our world, Ms. Slaughter’s rise above and beyond the naysayers has been no less challenging. She pays homage to her mother by showing that you achieve success through hard work and so, she works hard—and the result is a thriving career in the plus-sized fashion modeling industry. Ms. Slaughter has become a critically acclaimed and renowned face and body in print, commercials, and on the runway, receiving recognition across the national and international stage. 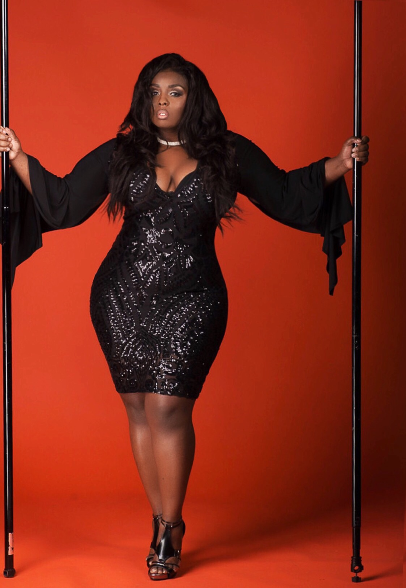 She brings her gourmet expertise as the Brand Ambassador of Godly Curves Boutique, two-time finalist in Cynthia Bailey’s Curvy Girl Photo Girl Contest, as the Face of FBM (Full Blossom Magazine) 2015-2016—and is featured on its cover http://www.fullblossommagazine.com/) in which she also provides an exclusive interview about how she’s taking the industry by storm, and as a T.D. Jakes Megafest Hair Battle Model, Promotional model for JCLyfestyle of Memphis, TN, Livie Rae Lingerie, Plus-Size Fashions online website and Queens Phasion Studio. She is also being awarded in Jamaica, August 2017, with the Peach Theatre 2017 Trendsetter Award. This is award is given annually to those who have broken artistic barriers and set standards of originality by the way of The Arts. This award is her personal magnum opus, or greatest artistic accomplishment, because it perfectly enthuses what she envisions through her photographic achievements. Lakesshia specializes in editorial photography. “When attempting to capture that phenomenal moment on camera, I portray the awe-inspiring emotions I feel at that time”. Her talent on the runway is evident in her many fashion shoots throughout the US which includes Curve Nation Expo Orlando, FL, 1426 Fashion Week 2015 Houston, TX, Harrisburg Fashion Week 2015, Harrisburg, PA, Ms. Camay's Black Tie Gala-2015, Seattle, WA, Pink the Runway 2015 in Philadelphia, PA, National Curves Day Washington DC, Indie Fashion Week of DC 2016, Black Fashion Week USA of Chicago, Fire on the Runway and Walk Fashion Show during NYFW 2017 to name a few. Being crowned Mrs. Mississippi Plus America 2016 and 2017, is her most recent accomplishment. She uses her title to inspire curvy women to turn their dreams into a reality and shine a light on child autism and women empowerment. On her plus-sized modeling journey, she exudes physical and mental health, saying “I believe you can be plus size and healthy,” and “I want to be an example to women that your size does not reflect your health.” Her mission is to encourage wellness, positive body image, and beauty with a healthy lifestyle for any size. At a gorgeous size 16, she works out four to five days each week, not necessarily to lose weight, but to build endurance and stamina, a must have in the modeling industry. Moreover, she delights that exercise just makes the body feel good. The evolution of the plus size industry has taken the world by storm. It is proving to the world that women over a size 12 are not only beautiful and healthy, but amazing! Nevertheless, while the plus size industry is making leaps and bounds towards the limelight, the plus industry is being met with heavy criticism and misconceptions. In addition to her mother’s self-evident illustration to her as to how hard work does pay off and will catapult her to triumph, she acknowledges her family and friends for the support and drive they continue to provide. Much credit is given Ms. Nikki Mack of Diva Day International Modeling Agency of Atlanta for the role she plays as a dynamic force in her life, pushing her to attain her goals. Every victorious athlete and artist needs effective coaching, and we learn that modeling is no exception to that rule; thus, Ms. Slaughter attributes much of her victory to her coaches, Barry Barnes and Arnetta (Soultry) Sanders. “They were hard, but the best.” And to them all, she offers a booming Thank You! But not only is LaKesshia a force to be reckoned with in the fashion industry and pageant world, she also has an astonishingly successful career in healthcare. She uses her Bachelor’s Degree of Science to work in radiology imaging. Performing ultrasounds, CT scans, x-rays, and echocardiograms, her specialty being Invasive and Noninvasive Vascular Imaging. She has used her vast skills to travel to different hospitals and clinics across the U.S., even being invited to work at the Mayo Clinic Research Hospital in Phoenix, and providing her expertise to the ultrasound team; she utilized that opportunity to provide excellent care to many people with a variety of cultural backgrounds. Because of the humanitarian she is, she was recently nominated for the “Sunflower Award”, the highest service award for healthcare workers, which is unheard of for a nomadic employee.